On November 12, 2011 I shot a wedding in Columbus Mississippi. That was a five hour drive from my house but I was happy to do it since I was doing it for a co worker and his wife, it was there granddaughter getting married. The brides family is a hoot so I had a great time with it. This is David, the GROOM. And this is the shot I took as he laid his eyes on Abigail, his soon to be wife. The family was staying at a house on campus, The Puckett House. A victorian style home that was an awesome place to shoot esp. since Abby was wearing an ivory, victorian style dress. It was beautiful. And yet another view while on the stairs. Love this shot. Trying to give the soon to be bride and groom sometime before the wedding events started.... but I still had to click shots since I did not want to miss a thing. Abby was a great bride to work with. Beautiful and all I had to do was tell her what I wanted. She was a natural. This weeks challenge for I Heart Faces is BUST A GUT. Just recently photographed a wedding in Mississippi. The bride and groom were great but the rest of the family was a blast. I think this photo fits well with the theme for this week with I Heart Faces. 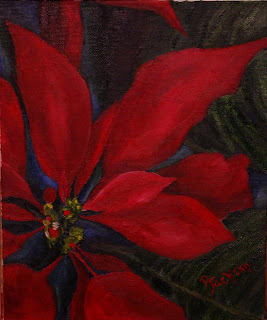 For the last few years I have painted my own Christmas card. Last year, I just could not find that inter painter in me so I used one of my photos. But this year, I am back on it. I will scan this when its dry and add Merry Christmas to it. I then just have 4x6 photos of it to mail as my Christmas card. I love being able to do a one of a kind card. Three years ago this month I was asked to shoot my first wedding. I have bought my camera for a hobby but that hobby has really grown to weddings and senior class portraits...and I love it. Through my "hobby" I have traveled to different places to shoot a wedding. 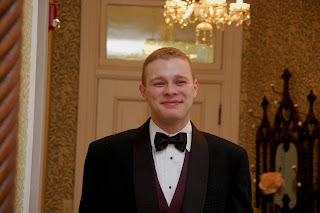 I have done 3 weddings in Maryville, TN which is a 3 hour drive from me. The longest distance I have gone was to Temecula, California for my son's wedding to my lovely daughter in law, Britney. My last wedding did not take me that far away but it did take me on a 5 hour drive to Columbus, Mississippi. A cute little town that reminded me so much of the Georgia town that my mom was born in. These house were off Main St. I so love the Victorian look. This is Puckett House. It is on the grounds of the college and anyone can rent it out. The rooms are $70.00 a night and to rent the downstairs that is an additional $150.00. The family of the bride stayed here and the reception was held here. In September I made and decorated my youngest grandson's b-day cake. Braden turned 1 year old. Then in October I did the cake for my oldest grandson, Caleb. Caleb turned 11. Two weeks later I was doing my middle grandson's cake. DJ turned 3 years old. And since he loves tractors, this was the cake I did for him. Can't ever remember a child wanting to eat cake before opening his gifts but that is what DJ wanted to do. I think he liked the cake Nana did for him. Now, I have a break till September 2012! Yay... thank goodness. I love the fall! I love the colors! I love the crisp feeling mornings and evenings. I just am not crazy about what comes after fall! And look at the blanket of colors that have fell like a puddle on the ground. Such a pretty spot to kick back and watch the colors blow in the breeze. A week and a half ago the colors were at their peak....and although we still have a lot, we also have some bare branches now. Get ready here it comes. 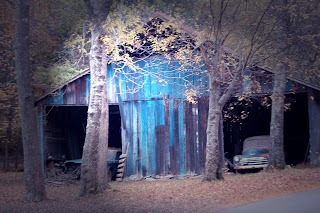 A blue, gray barn with these old cars in it. I love old barns and I love old cars. But I like the finished product. They are now in the craft room and working out great for holding all my stuff. Thanks to my daughter for moving them for me since I have been dealing with some pretty wicked back stuff. As you can see I lined them up side by side and now I can see everything. This is the wall across from the bookcases. The wooden piece I love but it is way to large to move into the other room so I have left it here and it holds a lot of containers of beads and other things. Not showing a pic of that right now since I still need to clean in there.